Robert Kramer, Norman Fruchter, John Douglas US l969 - 40 minutes, 16 mm, B/W English - In the summer of l969, Newsreel went to North Vietnam. This film moves beyond the perception of the North Vietnamese as victims to a portrait of how the North Vietnamese society is organized. It shows the relationship of the people to their government-how local tasks of a village are coordinated and its needs met. It deals with the reality of a nation that has been at war for 25 years, that is not only resisting US aggression and keeping alive under bombing, but that is also struggling to raise its standard of living and to overcome the underdevelopment of centuries of colonial rule. Amid much publicity, the footage was confiscated upon its return to the US. . Despite this attempt at suppression, PEOPLES' WAR has become one of the most sought-after films on Vietnam. Blue ribbon at U.S.A. film festival in Houston, Texas. and the Golden Bear Award, Moscow, USSR. Robert Kramer France 1998 French - This shorter piece is a free digression by Robert Kramer and his wife, Erika, as they look back upon the last ten years of their life together, and which leads them to question each other with the desire to always move forward as much as they can. Robert Kramer France 1997 - One of Robert Kramer’s latest work, Ghost of Electricity appears as a reflexion on technology and thoughts, where Kramer imagines a world in which both cinema and the sciences share a humanist interest in the bettering of our lives. It is also a declaration of love to his wife Erika and daughter Keja. Robert Kramer France/Portugal 1987, 1h30, 35mm, color English/Portuguese With Paul Mc Isaac, Vincent Gallo, Joao Cesar Monteiro - Doc’s Kingdom is the first film to introduce the character of DOC, played by Paul Mc Isaac, old friend and alter ego of Robert Kramer. Doc is an american doctor who lives in the suburbs of Lisbon, behind the city, where th Tage enters into the sea. Doc hasn’t been back home and hasn’t seen his wife Rozie nor ever met their son, and hasn’t seen his friends in over 15 years. In those days Doc was fighting against the Vietnam war; then he travelled to Africa as a doctor. From this collective adventure, he finally ends up alone in Portugal where he now lives a painful existence, between his warehouse, his long and lonely walks and the hospital where facing other’s suffering allows him to escape his own. Loneliness and alcohol have taken over. Slowly, the past is catching up with him : his son Jimmy finds him, and as they are almost ready to kill each other in a fight, Doc will finally understands that Jimmy is his son. They will talk, and the son will slowly understand why the father left abruptly to pursue his ideals and utopias. With Doc’s Kingdom, Kramer exposes with subtlety all the themes that are dear to him : alienation and return, his activist and filmmaker life in the US, the father-son relationship, and he succeeds in mixing the present with the past again, where generations confront each other and learn from one another. When the son returns home, Doc can start to think about going back to the US as well, where he will meet Kramer in another film, along Route One. Robert Kramer France 1996, 1h46, 35mm, color French with English subtitles With Laure Duthilleul, Jacques martial, Betsabee Haas - Walk the Walk is maybe one of Kramer’s only true european films, as it attemps to portray the life of 3 members of an interracial family that lives in the south of France. When the daughter decides to go into the world to make her own experiences and travels across Europe. the organic balance within the family shifts. The father, a sport teacher, will leave as well and embark on a boat, while the mother, a biologist, experiences absence and desire for another man. These three parallel stories allow Kramer to further experiment with his style and play with fragmention. He juxtaposes documentary and fictional elements as a cross between his own diary notes, a travelogue, and family drama, and creates a deep sense of the relationship between place and emotion. This work could be seen as a letter from a father to his daughter where he exposes his fears and worries, as well as his trust and admiration. It is also the tale, once again, of one generation confronted to the next generation and how they question each other. The film is dedicated to his daughter Keja, who once told him : "If you talk the talk, you better walk that walk". Robert Kramer, John Douglas US 1975, 3 hours and 15 minutes, 16mm, B/W and color English - This epic film represents an essential landmark within the political, intellectual and artistic entreprise of the 60's and 70's, following the Vietnam War. Milestones cuts back and forth between different story lines and features over fifty different characters, from Vietnam veterans to ex-convicts, parents and kids, native americans.... In 3 hours and 15 minutes, Kramer and Douglas expose the 'tribe' where all the alternatives of this generation are experimented. 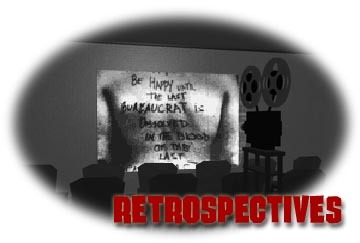 The film questions those experimentations's success and failures, as well as the directing methods of Newsreel cinema. In 1976, Serge Toubiana wrote in Les Cahiers du Cinema: "If in Milestones one deals with new relationships between human beings and with a new way of life which also integrates the vegetal world as well as the biological world, one also deals primarly with cinema, with a new form of cinema, as if Hollywood would not exist. Kramer doesn't make Milestones against Hollywood, he shoots as if Hollywood doesn't exist." Robert Kramer 1989, 4 hours, 35mm, color French with English subtitles ROUTE/ONE USA is the story of a journey, of a friendship, and of a distant as well as present past. It's Robert Kramer's second epic where both documentary and fiction coexist in one single style. The film features Paul Mc Isaac, long time friend and alter ego. Together they travel along the East Coast of the US , all the way from the Canadian border to Key West. Robert Kramer moves through the terrain of his country of origin, but also it's history, as well as his own past and his own imaginings. Through this extrordinary piece, he attempts a film portrait of "a people, but not the masses", focusing on particular people in particular circumstances to get beyond generalizations about "the American public". ROUTE/ONE USA is a movie which enables the film language to open itself : along this happy as well as worried journey, and through the various encounters, Kramer composes a cinematic landscape in order to understand the world were he and we move, and in order to act as well. Kramer is reinventing the world, and the light in the world, the music, the sounds. His eye is constantly aware and at the same time surprised by what it discovers every day. With this film, Kramer finds a style which will lead to his following work, and multiply the free and creative approaches of reality and history. Robert Kramer—who, according to Vincent Canby of the New York Times, "seems incapable of shooting a scene, framing a shot or catching a line of dialogue that isn’t loaded with levels of information one usually finds only in the best, most spare poetry"—died unexpectedly in France this past November at the age of sixty. He left a singular body of work—as far from Hollywood as it was from underground or experimental films—that eventually, he felt, would "make up one long film . . . one ‘story’ in a continual process of becoming." A committed leftist who emerged radicalized from his studies in philosophy and Western European history at Swarthmore and Stanford, he worked as a reporter in Latin America and organized a community project in a black neighborhood in Newark, New Jersey, before founding the Newsreel movement, an underground media collective which made some sixty documentaries and short films about radical political subjects and the antiwar movement between 1967 and 1971. 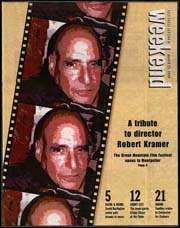 Kramer made his mark in the 1960s as the great filmmaker of the American radical left with films like The Edge and Ice. Embraced by the European intelligentsia, he eventually moved to Paris in the early 1980s, where he continued to produce fictionalized and documentary films on a range of subjects from Portugal’s April Revolution and post-independence Angola to the Tour de France—all the while maintaining his "uninterrupted dialogue with America." Our series offers the opportunity to sample a range of Kramer’s rarely screened work and to pay tribute to this unique cinematic personality. Robert Kramer (1939–99) was active as a community organizer in Newark, N.J., before making his first films in the mid-1960s; he soon became one of America’s leading independent filmmakers, with works that were at once politically committed and radical in form. In 1980 he moved to Paris, where he continued to make films. In memory of the late filmmaker, the Department of Film and Video presents a program of seven films from MoMA’s Circulating Film and Video Library. Robert Kramer: The New World, 1965–77 was organized by Laurence Kardish.